Patient performance status (PS) helps shape prognosis and determine the best treatment for a patient with cancer. Specifically, PS is a score that estimates a patient’s ability to perform certain activities of daily living (ADLs) without the help of others. ADLs include basic activities such as getting dressed, eating, and bathing, as well as more complex activities such as cleaning the house and working a regular job. PS is often included in physician assessments of patients, eligibility criteria for clinical trials, and guidelines for standard treatment recommendations. In short, it is a central factor in cancer care. Since patients spend the majority of their time outside of the clinic, self-report to providers, and undergo dynamic changes throughout their treatment experience, an objective evaluation of PS is difficult. Fortunately, a small study published in npj Digital Medicine may provide an affordable solution to current PS challenges. In the study, 37 patients used a Fitbit Charge HR to track activity, heart rate, and sleep. Meanwhile, researchers tracked patient step counts as well as standard measures of performance status, which are the ECOG and Karnofsky provider assessments and the patient-reported NIH PROMIS assessment. Researchers then looked for correlations between the step data, the traditional performance assessments, and outcomes, including all-cause mortality, hospitalizations, and adverse events. 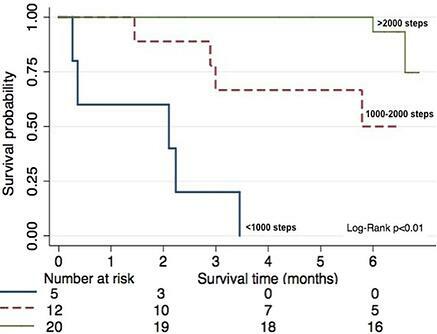 The study found that an increase of 1,000 steps per day, on average, was associated with significantly lower odds of hospitalizations, fewer serious adverse events, and increased survival. It also found that step counts correlated with assessment scores. That is, patients with higher step counts scored higher on the assessments while patients who walked less scored worse. The implications of the study are quite significant. Real-time, objective activity data may allow for a more accurate assessment of PS and physical function, while reducing the subjectivity and bias associated with current assessments. Although this was a small feasibility study, the findings still highlight another promising use case for activity trackers. A larger, randomized trial is the next step in order to validate results. While our results cannot definitively determine whether activity monitor data can replace ECOG-PS or KPS assessments, they do support their use as a supplement of current functionality tools. Not only were step counts and other activity metrics correlated with performance status, but they also provided a more detailed and continuous account of the patients’ activity levels with the additional benefit of being recorded in the patients’ free-living environments. Their use could also minimize recall biases while removing burden associated with completing multiple surveys and questionnaires in clinic.